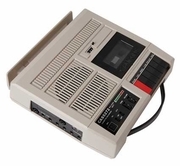 The CAS5272 Cassette Recorder/Player is built for reliability in demanding school environments. Ideal for ELL, ELD and foreign language applications, its 7 built-in headphone jacks are for individual and group listening centers. Its Directional SoundTM feature is ideal for presentations because it distributes sound out to the audience, not up at the ceiling.